... what the heck ARE THEY? It sure is an exciting class to watch, but I can't figure out what kinda bikes they are? They kind of whine loudly like two-strokes when they show the whole field, but I swear some of them growl like a four-stroke sometimes, albeit a dimunitive one and the exhaust doesn't look like a two-stroke pipe. Anybody know what they are? How many cc's? Are they just smaller versions of the big boys' bikes?? As said, they are basically CBR600RR engines in specialist frames. They only make about 130hp, so they aren't that fast, and in the scheme of things, easy to ride. I did some comparisons the other day after Assen, as this was the first track this season that I could compare the moto2 with the World Supersports. The Moto2's are much slower. My personal opinion is that they have not the technology or performance to be in the peak motorcycle racing series. They are something that would be good at local championships when developing young riders, but not at GP level. I don't know how they expect riders to move from moto2 to motgp. They will have nearly double the hp to contend with, plus all the electrics. The following times come from the qualifying sessions at Assen this year. Moto2 - Andrea Iannone had a fastest lap of 1’39.092. Further to this there were these 3 other riders under the pole time for the Moto2 class. Fair enough... figures don't lie. But they sure appear to be hauling *** and look as if they handle way better than a production bike. And after Wicky was kind enough to gtfm, from what I read I think the point of the class is to push the creativity of design, find new technology, see what the designers can develop as opposed to the technolgy already being incorporated into the existing 600cc bikes that are available for sale to the public. I think it says alot of the designers and tech development in Moto2 if the lap times of these mostly one-off bikes are so close to what the big-four have in their race arsenal. Have to disagree. The rules are very conservative as far as technology goes, even the motogp's have pulled back on the technology allowed. Most of these guys building bikes in this class have been building race bikes for some time, many working closely with the factories. The bikes are built purely for the track with no road use in their design brief. No doubt the chassis are good, it just further highlights how much of a dud the engines are. They are pretty much stock CBR600's. Over 1.5 seconds a lap faster isn't what I would call close. The racing is entertaining, but in my opinion, that is only because the bikes are so easy to ride at their limits, and their limits are so similar because the technology and rules are so restrictive. Great for entertainment, but in no way lives up to the prototype and technical development ethos that GP is supposed to deliver. Remember, their licence with FIM is prototype racing. WSB holds the licence for production based racing. From the figures you gave, its a little over a half second difference. Not a second and a half. Whether or not it is up to prototype standards I think is FIM's call. I do agree with you that it will be much more difficult for the riders to enjoy success immediately upon moving up in class from Moto 2 to Moto GP, but you can't deny that the racing has been spectacular. Look at the finish times for all the races this year compared to last year. The winner to second place finisher has averaged in the fractions of a second this year. I myself have enjoyed the racing. I just read this on another site. It looks like you may be right in thinking that the spec engines are not prototype enough. The end of the article talks about how they may change the spec engines after Honda's 3 year contract is up, to have 81mm bore 500cc twins. Last edited by Tweety; 06-29-2010 at 08:34 AM. I think that we have seen a number of 250gp ridders come up and nail the MotoGP pretty quickly. I think the reason behind that was that the 250 were still very much race bikes and the skill sets developed were in line with what the MotoGP bikes needed. These moto2 bikes are only cheap to run because they are basically a stock standard CBR600 engine. Once they try to get more power from them then they will draw horrific budgets like MotoGP. That's just the way it is with 4 stroke race engines. Even MotoX GP's have now admitted that their 4 stroke policies was stopping ridders and teams competing. The end result, they had to change the policies to get new blood into the sport. By way of comparison. Two production based motox bikes from the same manufacturer, say Honda CR250 and CFR250. the old two stroker has a piston life of 20 hours, and it could be changed in no time. The CFR250 has a piston life of 15 hours, and the procedure to replace it is much more involved. The old 500GP bikes were much cheaper to race than the current crop. The biggest problem for them was that Honda made a determination some years ago to save the planet and not make those terrible two strokes. At the time this was pretty much fair comment, they were dirty. Honda's position as senior manufacturer amongst the Japanese (the sempai/kohai relationship extends to industry) often sees the other manufacturers concede to Honda's requests, so it was only a matter of time before 2 strokes were dead. A secondary issue over recent times has seen the 250GP class stagnate and expenses increase. The bikes were just not being developed and built. After all, why build or develop something when you know you won't get a chance to race it. It is true that 4 strokes are strong in the market of production bikes; however there are manufacturers that have been traditional competitors in GP racing that do still use 2 stroke engines, and they have now been frozen out of using GP racings most attractive feature, technical development. I mentioned how dirty 2 strokes were. I should also point out this isn't the case now. technology has moved on, manufacturers like Honda have dropped the ball, and can't do much about it without loosing face. We now have companies like Aprillia producing two stroke bikes with air assisted direct injection, using technology from Orbital Engines. This is basically the same system as Mercury Marine's Optimax DFI. 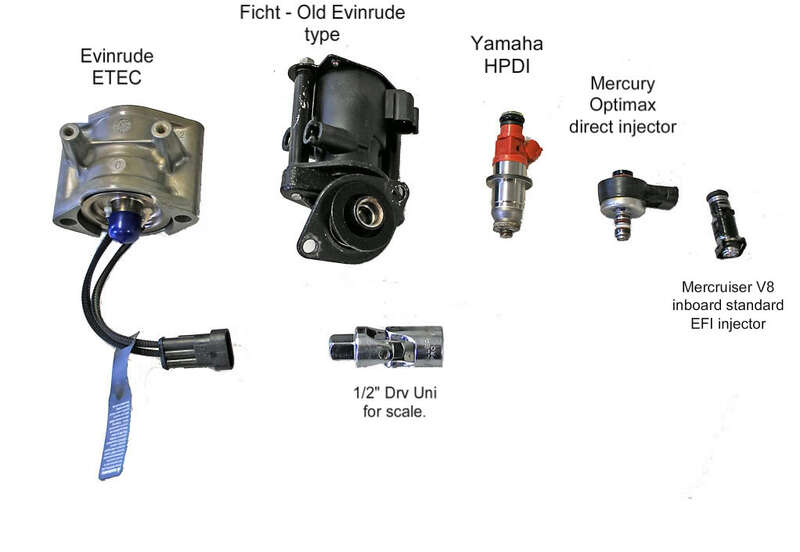 There are a few different takes on 2 stroke Direct Fuel Injection systems these days, some using reasonably conventional technology, and some with a very different approach. They are all being used in production 2 stroke engines at the moment, and they all are comparable or better to 4 stroke engines in terms of fuel efficiency and emissions. You may think that I'm biased with regards to two strokes, and you would be right. They are great sports type engines. Simple to rebuild, inexpensive, light, and with a better torque curve per size per hp. However, I'm not advocating going back to two strokes in GP. But I would like the technical rules to be free enough to allow those companies that see a future with current technology and two stroke engines to have the chance to develop them. As for GP's at the moment, even the MotoGP's are pretty restrictive, and they look like getting even worse with the 2012 plans for production 1000cc engines, and the 3 tiered bikes within the one race. Here are a couple of links that might be of interest. colinlinz, you did your homework. Direct injection is the key to clean burning 2 strokes. A probably little know fact is that in about 1990 Toyota was developing a direct injected 2 stroke inline 6 for the proposed T 100 pick up which was introduced in 1992. Obviously it didn't make it to production, but at the time I was telling my auto students about it. Also, unless my 63 year old brain is malfunctioning, in the old AMA Formula 1 racing format you could run a 500cc 2 stroke or a 1000cc 4 stroke. Since the 2 strokes deliver power to the crank on every downward stroke of the piston, the power comes on much quicker. Thus they could compete easily with 4 strokes twice their size. Kind of like how Ducati is allowed 1098cc in Superbike competition, because they only have 2 cylinders. Last edited by Tweety; 06-29-2010 at 05:59 PM. Why wouldn't they develop classes that few R&D for the manufacturers. If most forms of racing wrote rules that fit the needs of the companies entering, there would be far more investment. I consider the 2-strokes right up there with the 358ci, push rod, carbureted nascar circus. Why? Making a 2 stroke that can run reliably and meet emissions standards for the road (if you don't think bikes are going to be getting scanned every 2-3years in the near future, ummm DUH).. The problems are numerous, but namely that there is a problem with port timing and burn efficiency. Get the 125's up to 250 4 strokes (almost all have them overseas, let them develop them), run the 600's, but offer some concessions( think BTCC, keep it even with some weight). The 800's are not likely going to be production (but the technology will). I don't have all the answers, I am not sure if my ideas are even worth while. they should, though, offer some avenues to develop marketable technology. See my post, #12, about the old AMA Formula 1 mixing 2 and 4 strokes. You don't have to go back that far, Surfer. In 2002 they changed the MotoGP rules so that both 500cc two strokes and 990cc four strokes were legal. The 500cc twos got stomped so badly that nobody bothered to field one for the '03 season. I bought my '83 R100RS from my former girlfriend in '91, and at the same time pretty much stopped reading the mags and only rode Ortega occasionally, mostly I commuted. I just started following road racing again after buying my VTR new in the summer of '05. My SuperHawk resurrected my interest in motorcycles. Getting Speed Channel helped too. Yeah, the Moto2 bikes are 1-3 seconds per lap slower than the 250 GP bikes they've replaced. And yeah, if they were allowed to build 155-160 HP 600 cc motors that gap would disappear. But the goal wasn't faster bikes, the goal was cheaper racing. So they've gone from what had become the "Aprilia Cup" to "CBR600 with a custom frame cup". I don't care, I'd rather watch WSB anyhow. I've heard this expression a sick-making number of times in the near 40 years I've been racing. Every class evolves into an expensive class, simply because in the end the deepest pockets win. Then someone says it's too expensive, and the whole deal gets dumbed down again until a set of deep pockets works out a way to dominate again, followed soon after by all others who can emulate. Moto GP was, believe it or not, initially touted as a "less expensive" formula, on the basis that 4-strokes would be more durable than 2-stroke engines. Der (as Colin pointed out - hi, Colin, from another on the OzFS forum ). And then they changed the rules; and now they're changing them again. Hi Pete, I hope all is going well NZ. Let's not forget that by this time 500's had been left undeveloped for some time, besides a 990 would want to be faster. Common thought suggests that 2 strokes should make double the power per capacity than a 4 stroke, but the engines work very differently. 2 strokes will only make about 1.5 times the power of a comparable size 4 stroke, this because the pumping action through the crankcase has such a high parasitic load, they also loose out on revs. A 4 stroke can rev much harder than a two stroke. The roller bearings used with 2 stroke cranks and the piston weights see to this. The more you can rev an engine, the more fuel you can burn in any given time. So the old class sizing of racing 2 stroke with 4 strokes double their size isn't really as equatable as it initially seems. Let's not forget that the team budgets also tripled with that change to 990cc. It just seems a shame to me that there are bike manufacturers out there using modern two stroke technology, but no longer have a racing platform for development or promotion. As I stated earlier, I have no desire to turn back time. Just that I think the current rules are overly restrictive when viewed with the supposed ethos of GP racing. Putting all the technology discussion to the side for a moment (They are all valid points, and I am a huge 2 stroke fan, growing up riding MX on an RM125), do you feel the racing itself has been better or worse this year in Moto2 compared to 250's last year? Just curious on your thoughts. Yes, it has been entertaining from an on track race perspective. I'm just looking for more than entertainment value out of an international premier bike racing series. To be honest I've seen just as entertaining races in the bucket class at club level. The harsh reality is that these days racing is viewed more as an entertainment spectacle, and less as a chance to launch and test new technology. I also feel that the dumbing down of the bikes has detracted from the individual riders skills and triumphs. The new 600's are just too similar, and their limits too easily reached. I quite enjoy it when I see someone with exceptional talent harness a bike that is just too much for mere mortals like myself. I teach Automotive Technology at SkillsTech in QLD Australia. I mainly teach the light marine technology, which covers just about anything up to about 50', PWC, Outboards, Inboards, Sterndrives. Because of this, I work with a range of different 2 stroke DFI engines varying from 40 hp twins through to 200+hp V6's. Evinrudes ETEC is the most unusual of them. They have used a very different approach to any other system I have seen. The injectors actually create the pressure (up to 600psi) rather just act as an on/off valve. The injectors can vary their stroke and their pressure to create a different plume depending on needs. Their main problem is that they lack design partners, so they are only working with their direct experience and R&D funds. I think there is a lot of untapped potential in this system. I mentioned Mercury's Optimax system, this is a version of Orbital Engines air assisted DFI, and very similar to the one used by Aprilia in their small 2 stroke bikes and Bombardier's 2 stroke Jet Ski's. This system used fairly conventional injectors, but has two injectors per cylinder, that are set up in series. One injector is for fuel, the other air. They run an air rail, and a fuel rail. The fuel injector opens and allows pressurised fuel into a small chamber above the direct injector. This small chamber is in the pressurised air rail. When the direct injector opens, the pressure pushes the combined air and fuel into the chamber. The air is used purely to break up the fuel a bit and help it burn more efficiently. This system is my current personal favourite. There is also a system that Yamaha have had for some. It is basically like a standard injection system, but with a larger injector situated in the cylinder head. They use fairly high fuel pressures, up to a 1000psi. The use a mechanically driven piston pump to achieve these fuel pressures. The picture below will give you an idea of the range of injectors currently used. 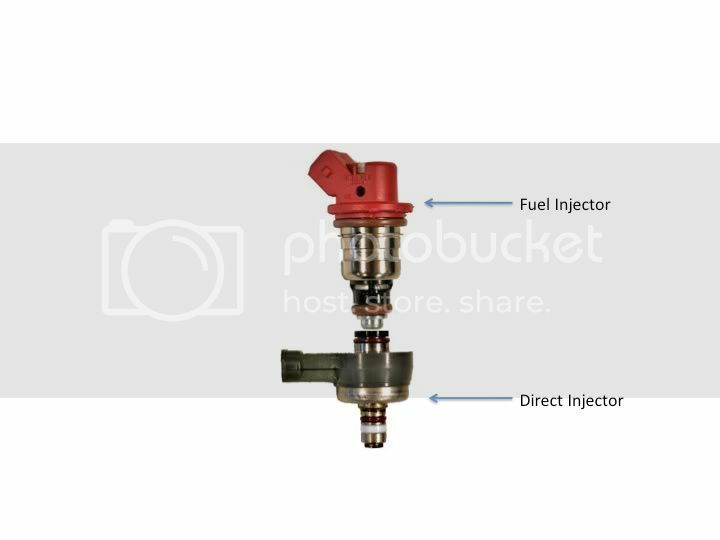 In the top picture I don't have an Opti fuel injector, but the picture below that will show both the fuel and direct injector, as they would be positioned in use. Moto 2 has been the best, most agressive road moto racing this year. By having spec engines it takes that part out of the team budgets (or at least having to grow that portion of the budget). It effectively takes the moto factories out of it and leaves it to racing teams. Who cares what the stopwatch says? If 5-6 guys are still fighting for the lead with 5 laps to go the lap-times are unimportant. Transitioning from a 4-stroke to another 4-stroke is going to be easier than from a 250 (notice that last year's 250 leaders are nowhere on the MotoGP bike). I think they nailed it with the Moto 2 class. I could do without MotoGP all together, it's still wallet racing and the least interesting to watch compared to Moto2 and WSB which have both been consistently closer. On track racing at the moment is fun to watch, but no more than the older 250's. Sure towards the end of their time this wasn't the case, but that was only because the talk of doing away with them had killed off development and manufacturers. It's racing. The stop watch is god, everyone bows to it. The transition from two stroke didn't seem to hinder Rossi, Stoner, Lorenzo, Pedrosa, Dovisiosa. On the other hand, not to many WSB riders have successfully transferred. When someone like Jeremy Burgess says that he believes the 250's prepared riders better for motogp than the 600's I tend to listen. This is mostly just my opinion, but as much as parity racing can be good to watch, it doesn't offer much value to the bike industry. I expect more than on track entertainment from the international premiere racing series. I want the off track entertainment of the competing technology. I want the total package to offer me more than an entertaining couple of hours once in a while. I want to see new ideas get proven or disproven, I want to see how they adapt themselves to what I'm riding. I know, I'm being selfish; but on track entertainment is just not enough. I want to ride better and more interesting bikes. If I'm to settle for just entertainment, there are domestic racing series here that I can watch. So far I've seen many more great 250 races than moto2, time will tell if they can maintain this level. That's true regarding JB's initial remark. However; it was only a couple of rounds ago he remarked on air that he thought the gap between moto2 and motogp was too great. This remark was specific to moto2. On an aside, at this point in time, I think the production based 600's are more of a race bike than the moto2's. The lap times re-enforce this. Apart from the boring moto2 engines, the chassis rules are too conservative. Motogp is by no means perfect. I haven't liked the changes there either. Too much pandering to Honda's requests. The move to 800's was mainly pushed by them. They thought they would hold an advantage at this size because they could maintain all the same combustion R&D. Once again, I would have liked to have seen the opportunity to change to have been used to free up the design limitations. They could have done this, and regulated team budgets to limit expense if needed. Now they talking about the 2012 change to be 1000cc prototype racing, and using a 2nd tier of production based engines all in the one race. I'm not totally sure about the buy back class. It might be within the second tier, or perhaps it is a third tier. To me it sounds crazy, almost dangerous. Can you imagine having factory bikes running against teams racing production engines where any other team can buy their bike at any stage for a predetermined fee? Mind you, if JB has his way motogp will change to 600cc. If this happens, then moto2 will make better sense.